As far as eating marshmallow Peeps goes, people either love them or hate them. But we can all agree that using bunnies and chicks in miniature scenes that imitate pop culture or real life can be a real hoot (peep?). The more serious the scene, the funnier they become. Here are some you might enjoy. If aliens from outer space landed on Earth, we might find them to be a little funny-looking. No need to send out the troops! Christine Krizsa shows us how it might happen, down to the pie plate-shaped flying saucers. We don't know how accurate William Shakespeare's version of Julius Caesar's death was, but it probably did not involve bunnies. 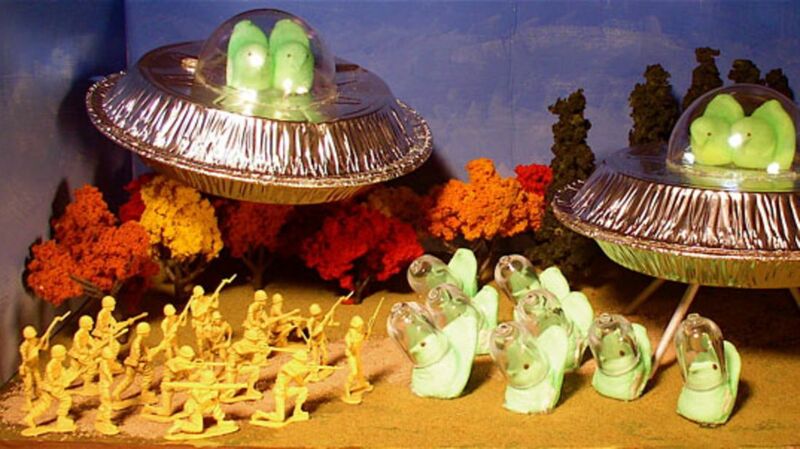 Yet we all recognize the exact scene in this Peeps diorama. Children's books are a good source of Peeps inspiration. Every child will recognize Goodnight, Moon even when populated by Peeps. MaryLea Harris entered the Washington Post diorama contest in 2010 with her scene from the book. The paper announced in March that they'd no longer hold the contest, so you'll have to send your diorama entry elsewhere. Instagram user June Miller Richards knows the value of blue crystal, even when it's made of sugar crystals and melted candy. Her diorama puts Peeps in place of Walter White and Jesse Pinkman in the TV show Breaking Bad. Many libraries across the country are staging their own Peeps diorama contests. The Minerva Public Library in Minerva, Ohio, has a diorama contest open for submissions until April 14. One of their librarians started things off by building this scene from the TV show The Walking Dead. You can easily recognize the characters Negan, Rick, and Michonne by their accessories, even when they are all bright yellow marshmallow underneath. Debbi Crane made this diorama featuring Michonne, Daryl, Rick, and Carl from The Walking Dead, along with a horde of zombies. She took this picture three years later, which just goes to show how well Peeps stand the test of time. How about a video game made of Peeps? Instagram user Mona constructed a candy version of Pac-Man using both Easter bunny Peeps and Christmas tree and snowman Peeps. Another horde of zombies appear in Nicole Blake's Peeps diorama depicting the familiar dance from the music video for "Thriller." You can see Michael Jackson and his date in the front; they're the ones without the dead, blank eyes. Historical reenactments are a popular subject for Peeps dioramas. Miranda Gallagher had bunnies and chicks portray the rebels at the Boston Tea Party in her diorama. It only makes sense that marshmallow bunnies can do without their tea, as we all know they prefer hot chocolate. Instagram user Renee not Brittany photographed this replica of Ford's Theater in Washington that illustrates President Abraham Lincoln's assassination. Once you overlook the absurdity of bunnies in the roles of the president, Mrs. Lincoln, Major Henry Rathbone, and John Wilkes Booth, the details in this scene are very impressive. The life of Alexander Hamilton was historic, and the Broadway musical about him is sure to be considered that too. Kate Ramsayer, Helen Fields, and Joanna Church entered the Washington Post Peeps diorama contest last year with a recreation of Hamilton. If you can't read the Peeped-up lyrics in the picture above, you can see them larger here. Movies are the most common inspiration for Peep dioramas, since they have such a variety of settings, and the more Peeps, the merrier! Rochelle Storer Bartschi used a lot of Peeps for this recreation of the Battle of Helm's Deep from the movie The Lord of the Rings: The Two Towers (2002). Tim Burton's Sweeney Todd (2007) was a gruesome take on the bloody classic, but it's all much easier to digest when the characters are made of marshmallow. Matt and Theresa entered this diorama in the Washington Post Peeps diorama contest in 2009. Put a whole box of Peeps into matching frilly pink dresses, and what have you got? The movie Bridemaids (2011). Instagram user hollyberry1274 turned this sweet idea into a diorama last year. Daniel Spiess recreated that horrific scene in Alien (1979) in which we are introduced to a chestburster. He said, "I really should not be left alone with the Easter candy." All the Star Wars movies have been made into Peeps dioramas, although some scenes are funnier than others. Here we see Han Solo being frozen in carbonite (a.k.a. chocolate) in The Empire Strikes Back (1980), posted by Instagram user Coast To Coast Vintage Adam. Star Wars: The Force Awakens (2015) joined the pantheon of Peeps dioramas last year. This scene depicting the cast was an entry in the diorama contest at the Library Arts Center in in Newport, New Hampshire, last year. The center is holding a contest this year, too. Bruce Applen via Flickr // All rights reserved, used with permission. You can't go wrong with the classics. Godzilla terrorizes not Tokyo but a meadow full of bunny Peeps in this scene from photographer Bruce Applen. You'll be glad to know the Peeps eventually got their revenge. Morgan used miniatures, including tiny Christmas lights, to recreate the scene in Pixar's WALL·E (2008) where WALL-E shows his beloved plant to EVE. Both robots look good with adorable marshmallow bunny ears. Kira Maples couldn't resist snapping a picture of a Peeps diorama displayed at the Denver County Fair. The Rocky Horror Picture Show (1975) is one of her favorite musicals, and she loves a good pun! See more Peeps dioramas in our previous lists.